These Celtic earrings have been hallmarked 18K gold by the Irish Assay Office at Dublin Castle in Ireland. These 18K white gold Celtic earrings are Trinity knot studs that have been set with 42 brilliant cut diamonds with a clarity grade of SI 1-2, and rate G - H on the color scale, for a total diamond weight of 0.50ct (1/2ct.). 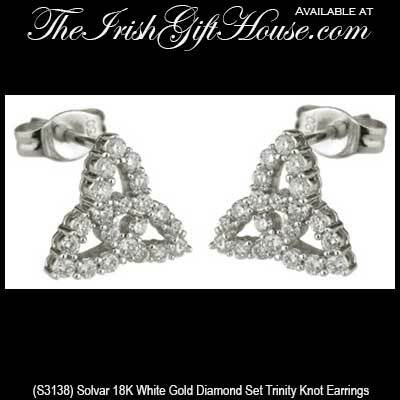 The Celtic stud earrings measure 7/16” wide x 7/16" tall and are made by Solvar Jewelry in Dublin, Ireland.